Gifts are an integral part of Rakhi celebrations. 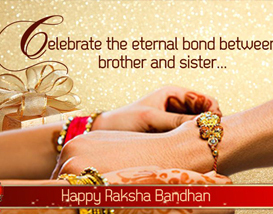 As per Indian tradition, Rakhi gifts are given by elder brothers to the sisters in acceptance of their raksha. They bless their sisters after the thread tying ceremony and give gifts. 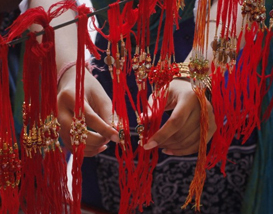 In the case of younger brothers, it is the sisters who give them gifts along with the Rakhi. 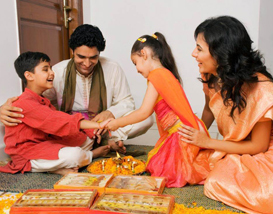 The gifts given on Rakhi include sweets, dry fruits or clothes etc. Of late, it has become customary for the sisters to gift something in return to the brothers, younger or elder. The reason for this change are the ever increasing distances. 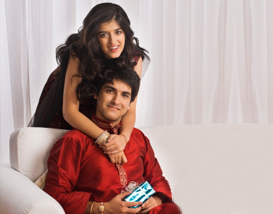 Rakhi gifts are an extended expression of love and affection that the siblings share. One of the major changes that has occurred in Indian tradition of Rakhi gifts is that watches are gifted as Rakhis. Wrist watches are long lasting and are a constant reminder to the brothers of their love for their sisters . It is the most readily acceptable replacement among gifts for a Rakhi, as it is tied on the wrist and is useful. Another recent Rakhi gift tradition are jeweled Rakhis. The bracelet type of Raakhi can be of gold or silver. It could be embedded with precious or semiprecious stones or, it could be a simple cut and carved bracelet. Such Rakhi or Rakhi Gifts are favoured for their durability and of course for the value of the jewels in the Rakhee. 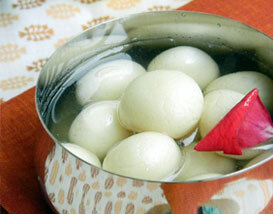 Sweets and chocolates have always been a part of the gifts given on Rakhii. Dry fruits are a convenient alternative and more preferred these days as Rakhi gifts. Pen sets, shirts or tie or a jeweled tie pin are other nice Rakhi gift options. So, this Raksha Bandhan, gift your brother something he loves. Gift him something that will remind the two of you of the lovely time spent together on Raakhi.